At approximately 5:15 p.m. on Friday, Nov. 1, my mother-in-law called me on my mobile phone as I was driving out of the parking garage at work in Midtown Atlanta. “Lanny has been in accident,” were the words that began a journey for our family that culminated in another phone call, at about 10 a.m. on Thanksgiving Day. When someone has been a part of every major life event for 18 years, it’s hard to say goodbye. 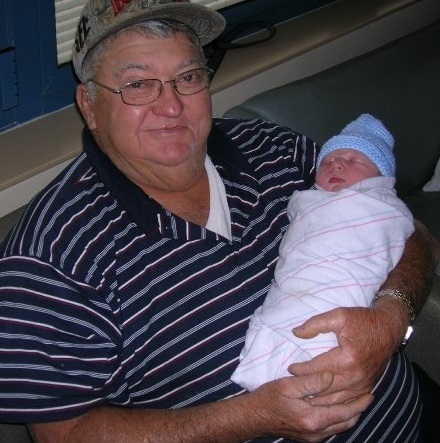 Here, Daddy welcomes Carlton into the world in October 2008. During the last two months, our lives have been emotionally and somewhat physically upended. My mother-in-law lived at the hospital in Augusta for more than three weeks while Daddy was treated in the shock and trauma unit. Carla spent countless hours commuting back and forth to Augusta to be by her mama’s and daddy’s side. Hundreds of people supported us with childcare, meals and financial gifts to defray the cost of travel and feeding our family while Carla was out of work. Our church family at Parkway proved that care and love was not lip service. My parents left their busy lives and commitments to come and be with us, getting the boys on and off the bus and allowing me to do my job. 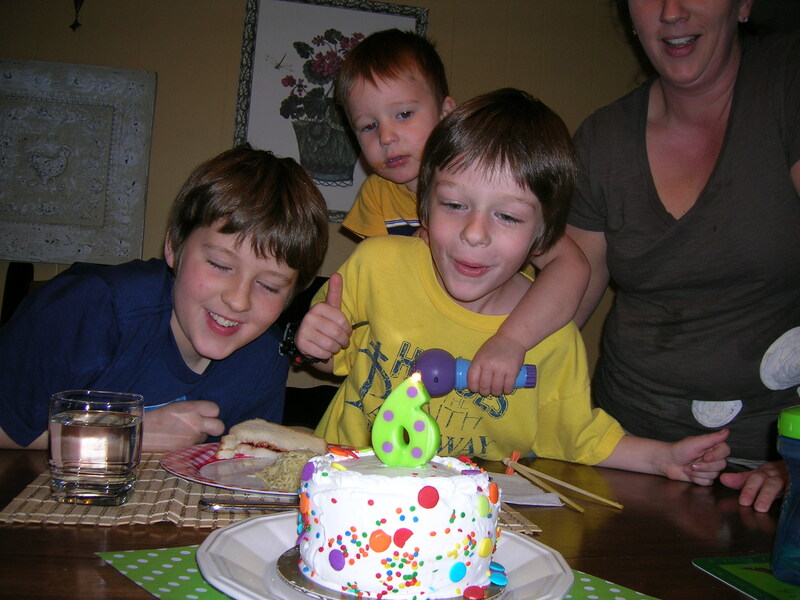 Our across-the-street neighbors took our boys on so many occasions I have lost count, including on Thanksgiving Day just moments after our boys learned that their grandfather had died. This is a lot to go through, to understand, to process, to grieve. And like an actor in a supporting role, I have tried to play my part, dutifully, with strength and grace, out of the limelight but lifting up those around me. But in the process, I fear that I have tamped down my own feelings of loss and regret. As the son-in-law, I have no blood-relation claim to the grief that my wife carries and is so amazingly overcoming. Even my sons have certain rights, by my way of thinking, which entitle them to grieve this loss in an open way, as best as children can, according to their emotional maturity. Please don’t misunderstand what I’m about to say: I know this is not about me. I’ve repeated that mantra so many times in the quiet moments at home around the supper table with my boys as their mother was away. I’ve whispered it to myself in hospital waiting rooms. I’ve recited it as I drove to the hospital on Thanksgiving Day, tears obscuring my vision, knowing I was about to stand with two people I love dearly and look on the face of my father-in-law who would no longer be present in that body. I know this isn’t about me. I really do. But how in God’s name am I supposed to feel? Am I allowed any grief? How can I ease the pain of loss that is just beneath the surface, taking all my energy to control as I navigate through my days trying to focus on working and receiving the generosity and care of others and giving care and strength to my family while celebrating holidays? How do I get over this? Do I get over this? Is trying to move forward a dishonor to Daddy’s memory? Is feeling or desiring joy a betrayal? Is gloom and sorrow the only emotion to feel? Why do I think that showing sadness just makes me appear weak, pathetic and a pretender, someone who simply wants attention or to participate in a loss that isn’t really his? No one has made me feel this way. It’s all in my head. But until now it has remained in my head. Regular readers of New South Essays will know that I haven’t published since the day of the accident. Even though I had a topic in the queue and a draft ready to post, this medium seemed so distant in my priorities that I couldn’t bring myself to put it out there. I have been in a state of survival numbness that has blocked my ability to express anything, much less an essay. I was blessed with the opportunity to offer a personal eulogy at the graveside service. It took all of my resources to craft an appropriate word, and writing it did offer a beginning of my own healing. Delivering it to a hurting company of family and friends on that gray December day left me utterly spent as I struggled to say words that were so connected to my heart that I struggled to breathe and give voice to them. I haven’t written anything since. Today, I am making you part of my journey of grief. If I have resolved to do anything differently this new year, it is to loosen the reins on my emotions and let some of this out. I can’t keep pretending I’m OK. I’m really not. Lanny Carl Barron was not a perfect man, but he was “Daddy” to me. I have a father. I am blessed to have a dad whom I deeply love and who is still here for me to guide me and support me. I need that wisdom and care now more than ever. But that does not stop me from missing Daddy. Too often I refrain from saying out loud just how much because I don’t want to upset my wife, Mama or the boys. But here, now, I am telling you that the loss of my father-in-law is affecting me in a profound way, tapping into unresolved grief from losing my grandparents and maybe every other type of loss I’ve ever experienced back to the days when my first boyhood dog had to be put to sleep. I promise not to let New South Essays become a morose stream of my darkest thoughts. As the clouds part, I will be able to give energy to other topics, but today, I have to begin my return to feeling by sharing this. Thank you for reading. And if this somehow speaks to you in your own journey of grief, then God bless you. I know that I am not alone, and that does make a difference. This has always been an interactive forum, and you are invited to leave your thoughts in a comment below. Thank you for being loyal readers, patient with my two-and-a-half month sabbatical. Perhaps you have unexpressed feelings of loss and that putting those feelings in a comment here will help. I invite you to share. With age comes responsibility, and one of the responsibilities of children aged 5 and older in our house is eating vegetables. Lest you think Carla and I are unreasonable parents, we are not clean platers. The quantity of the food consumed is not our beef, so to speak. We insist our children eat vegetables as a way to deliver the essential vitamins and nutrients they need to grow and develop a palette for food beyond French fries and macaroni and cheese. Parents are sneaky. They have been known to put vegetables into otherwise delicious dishes such as fajitas. Looks suspicious, but Carlton dives in anyway. Oh no! The unthinkable has happened! Vegetable tongue contact! All that fuss over one little slice of bell pepper. This has set in motion an inevitable clash of wills between us and the newly-minted 5-year-old in our house. As every parent with at least two kids knows, it’s harder to hold the line on household policies with the youngest. And with Carlton’s pleading, his older brothers have seized the moment to lobby for vegetable leniency. Hopefully, after this week, they will get it through their still developing cerebral cortexes. Appeal denied. This week’s showdown occurred on Tuesday night with lettuce. That’s right, lettuce, the most innocuous of all the leafy vegetables. It was a salad of mixed greens, and Carlton balked. He knew the rules, and yet we had all washed our plates and left the table and still he sat. Oh the weeping and gnashing of teeth. It was almost comical if it wasn’t so annoying. As bath time approached, a last minute compromise was struck to avert household shutdown: You can leave those last few pieces of your salad, but what you don’t eat tonight, you have to eat for breakfast. You can see what we were doing there, right? No one wants to eat wilted lettuce. The only miscalculation in that strategy is that a 5-year-old doesn’t care about consequences. He only wants to get away from the table right then. The next morning I was already embroiled in my commute by the time Carlton made it down to his breakfast of soggy leaves. The outcome? We’ll get to that in a minute. 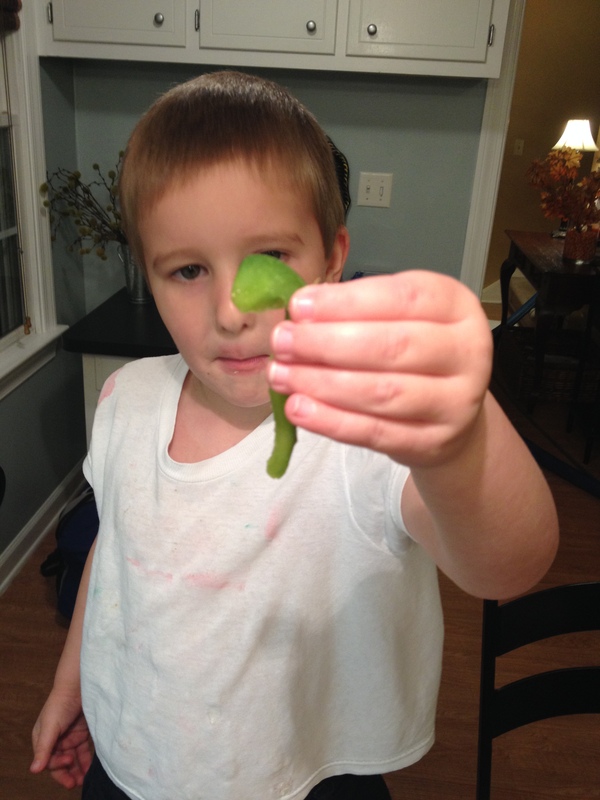 One of the key points of contention raised by my older boys is the type of vegetable prepared for them. They want less spinach and zucchini and more corn on the cob and potatoes. Carla has informed them that those are “starchy” vegetables and don’t count. Nevermind about those Southern meat-and-three restaurants that include mac-n-cheese as a vegetable. This distinction has produced the most protest. 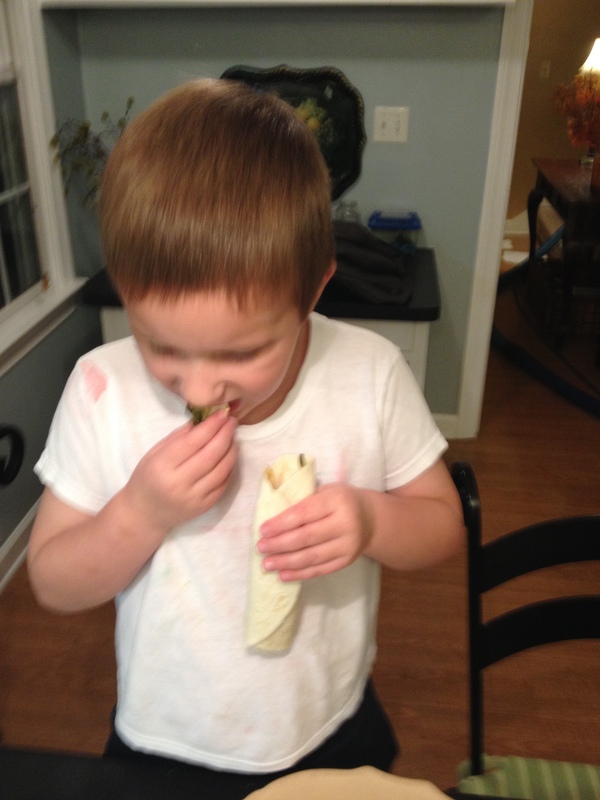 Barron is willing to eat more broccoli if he can have a break with the Brussels sprouts one night. It seems that his issue is balancing the less appetizing vegetables with the more tolerable ones. Harris seems to find the supper table to be an apropos stage to rehearse such histrionics that would surely win him an Oscar, an Emmy or a Tony. The gagging, the eye watering, the wailing, the begging. Parents with lesser resolve would have caved in years ago. But in the three years since he came of required vegetable consumption age, I’ve come to be more amused by his antics. They remind me of the stunts my brothers and I used to play: scattering the English peas. Adding squash to your brother’s plate when his head was turned. Chewing up the liver and onions and spitting it into your napkin. I’m sure none of those tactics worked with my parents, just as I am sure none of them work for my boys. Back to the lettuce. I got home from work that night, and with a big smile Carlton proclaimed “Daddy, I ate my salad for breakfast!” Definitely not the reaction I expected. Maybe the trick is to start the vegetable consumption early in the day, before they are awake enough to know what they are eating. So why do we do put ourselves through this? It’s simple. Love. We want what’s best for our children, including a healthy diet, and we are willing to put up with some nonsense to achieve that goal. They may not thank us, but one day, they’ll have a good laugh at the crazy stuff they used to do to avoid foods they readily eat as adults. What are the foods your children refuse to eat? What are the methods they used to avoid it? What is your counter-attack? 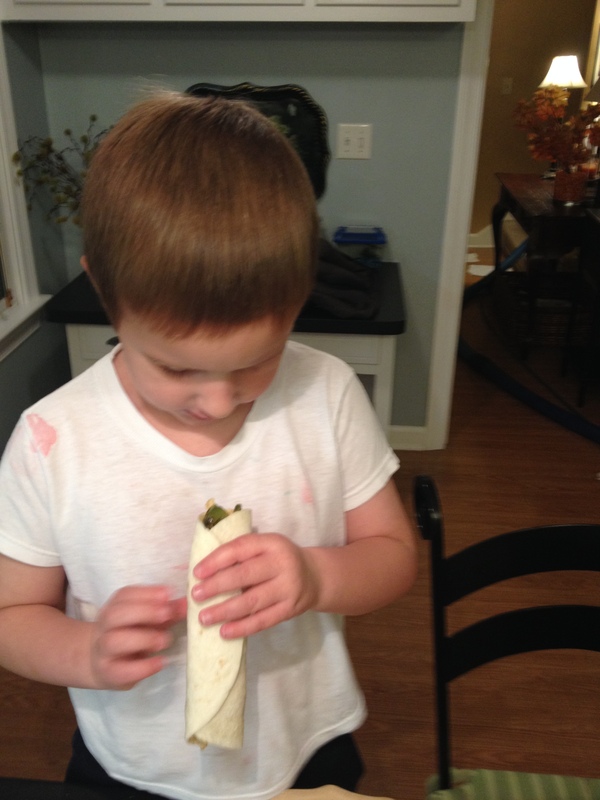 What is your view on forcing kids to eat vegetables? Are we being cruel? Leave us your thoughts in a comment below, and we’ll all be healthier for it. If this is a rare experience for you, you must be living in the New South. 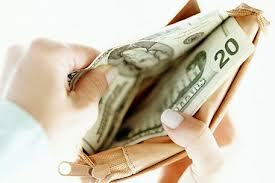 There is no amount of wealth that can surpass the all-too-rare occurrence of having a wallet full of cash. In these days when plastic pays for everything, the times in which I have actual greenbacks on my person are so few that I can’t help but feel special. It doesn’t matter if its $7. Carrying cash makes me feel like I’ve got money, no matter what the bank statement says. I think it’s another symptom of life in the New South. People used to have to carry cash. How else would you get a “Co-cola” when the impulse arose? Or how would you fill your gas tank without a $10 tucked away in a money clip? For about the last 10 years, whenever we need cash for an activity, we have to borrow it from our kids. Carla’s Dad always has cash on him. He’s of that generation, and, frankly, it’s one of those attributes in him I admire. I somehow feel less masculine to be penniless and have to pull out a card to pay for something. He shares this cash with his grandsons liberally. Every time we visit, he concludes his time with the boys by handing them their “Poppy Money.” Hence the reason they always have cash. A few years back Carla implemented the cash-only Dave Ramsey method of financial management. We tightened our belts and spent less than we ever have, but I felt like Warren Buffet because I always had a wallet-full of paper money. 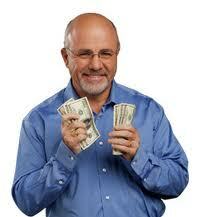 I never see Dave Ramsey without cash. He must be doing something right. The theory behind Ramsey’s approach is simple: you spend less when you realize how much you are spending. Swiping a credit or debit card doesn’t have the same psychological impact as handing a cashier money. The economic principle of scarcity doesn’t exist when you use plastic because you never really know where the bottom is. With cash, when your wallet is empty, you stop spending. All the folders and envelopes got to be a nuisance, and we eventually abandoned the plan out of logistics and time shortage, but when it comes to feeling in control of your money, nothing beats having cash. It used to be that carrying cash made us feel more vulnerable. Someone could grab your purse or lift your wallet, and you would lose money. Today, however, it’s more likely that someone will steal your credit card number or, worse, your identity, and rack up huge charges before you ever find out. In most cases, cash is actually safer. When debit cards first came into being, we bought the lie of convenience. You don’t want to have to go get money out of the ATM to have cash. Well, if you remember, there was a day, not so long ago, when you received an actual pay check. You took said check to a bank where you cashed it, depositing some into savings and checking to cover the bills you paid with a check. You left the bank with money in your pocket, and you spent that money until it was gone. And when it was gone, you stopped spending. That’s not inconvenience. That’s intelligence. Debit cards give you access to more of your money than is prudent, and credit cards are a bottomless pit. Besides, I have no relationship with my money anymore. My remuneration is directly deposited into my bank account. I never see it. Bills are paid automatically out of my bank account or are paid with the click of a mouse online. I haven’t conducted the experiment, but I bet I could very nearly abandon cash altogether. So at the risk of sounding like a Depression-era financial adviser let me simply conclude that cash is a rare commodity in the New South. I don’t know if it is progress or not. The absurdity of paying more than $5 for a cup of coffee surely would sink in if this was a purchase we regularly used cash for. Do you find that you never have cash anymore? Do you find it as embarrassing as I do to be caught without money? Have you tried or are you still using Dave Ramsey’s cash-based personal financial plan? Share your thoughts by leaving a comment below. We’ll all be richer for it. For the past two weeks, Carlton has been without his favorite sleep-aid: Lion. This now raggedy stuffed animal with the roaring voice box that hasn’t worked in several years has been his constant sleeping companion for the better part of five years. But two weeks ago, a weekend with the grandparents was so much fun that Lion opted for an extended visit. 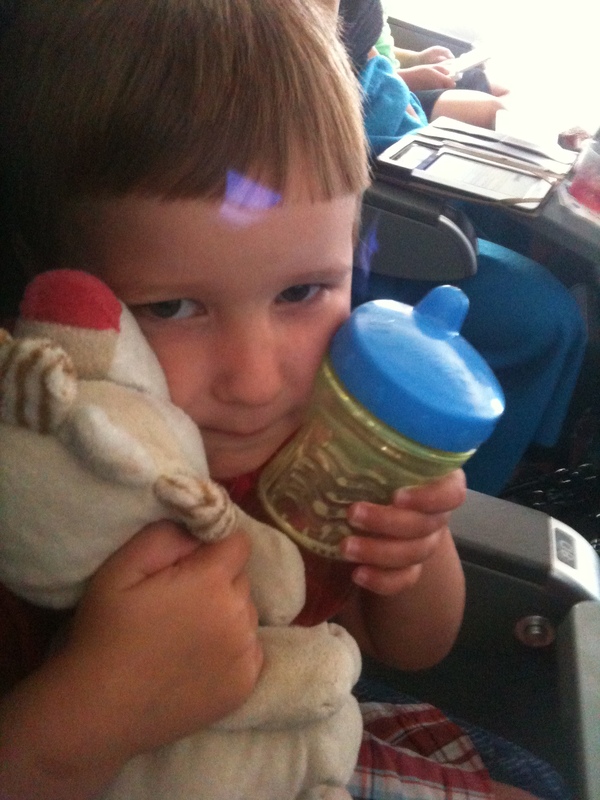 Carlton hangs on to Lion and his apple juice before his first plane ride back in June 2012. On the first night without Lion there were tears. It hasn’t been easy for Carlton to adjust to life without Lion, and some nights he has begged us to call Nanny to have her mail it to us. He even tried earlier this week to persuade Carla to drive to Sandersville on Friday just to get Lion. Overall I’d say this has been an important weaning process and not nearly as painful as we first imagined. Carlton is not unlike his brothers in his attachment to a stuffed animal. Barron has his Yee-hi. This furry monkey was given to him by our Macon friends, Cass and Ruth DuCharme. For a while it appeared that Barron would succumb to the old cliché and take Yee-hi to college, but he gave him up before elementary. Harris was the least attached to a stuffed animal. One year our school had a donated stuffed animal adoption at Winter Fest. Harris was somewhere around 3 at the time. He fell in love with a cuddly turtle that he promptly named “Swimmy.” I know, turtles aren’t known for being especially cuddly, and Swimmy must not have been either because he was relegated to the stuffed animal box in less than a year. Swimmy was also impractical because he was kind of big. It’s hard carrying around a 150-year-old giant sea turtle. OK, that may be a slight exaggeration, but he was about half as big as Harris was at the time. All of this adjusting to not having a figurative security blanket reminded me of my own, literal security blanket. I carried around a very masculine, Winnie-the-Pooh sleeping bag long past any age when it was appropriate, probably 17 or 18. Again, I jest. Maybe 6 or 7. In any case, I really liked this blanket. I would drag it into the den and lay on it while watching cartoons. Back then, it was good to be close to the TV so you could turn the channel. Yeah, I’m old. Truth be told, I feel like his “lovies” are harmless. 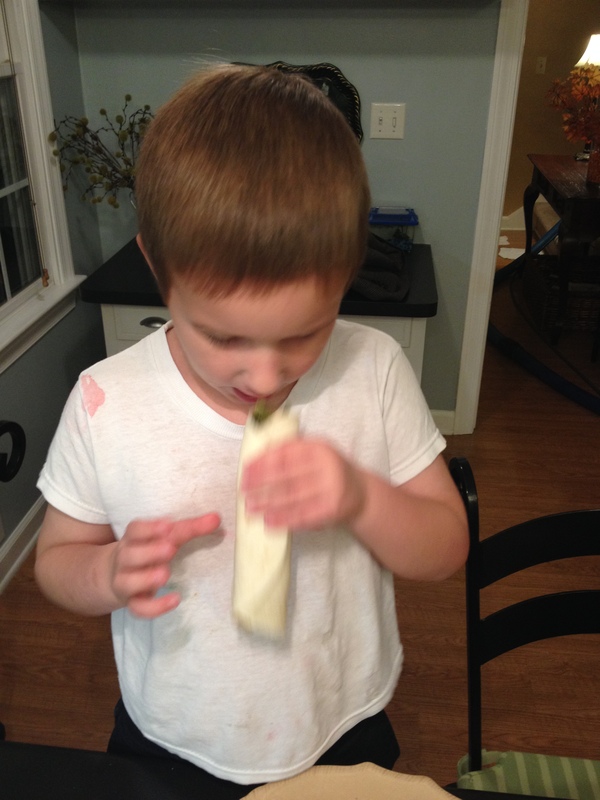 It’s OK for children to have items they cling to a little bit for comfort. I’m no child psychologist, but as long as they give them up before middle school, it’s not something I get worked up about. What I do wonder about is what we replace them with. Do we really ever give up our Lions and Yee-his and Swimmys? Do we just latch on to something else for security? 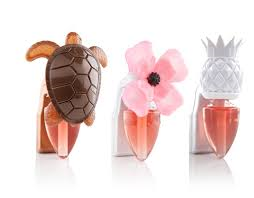 Do we become emotionally mature or do we just switch to our iDevice, a piece of jewelry or fashion accessory? Where does our sense of comfort and security come from as we age? Lion has been there for some of the best naps and longest car rides. Carlton turned five this week. We are nearing the end of the stuffed animal stage altogether. I guess it’s time to find that box where Yee-hi and Swimmy hang out. It won’t be long before Lion joins them in retirement. What was your childhood security blanket or lovie? Do your children have them? 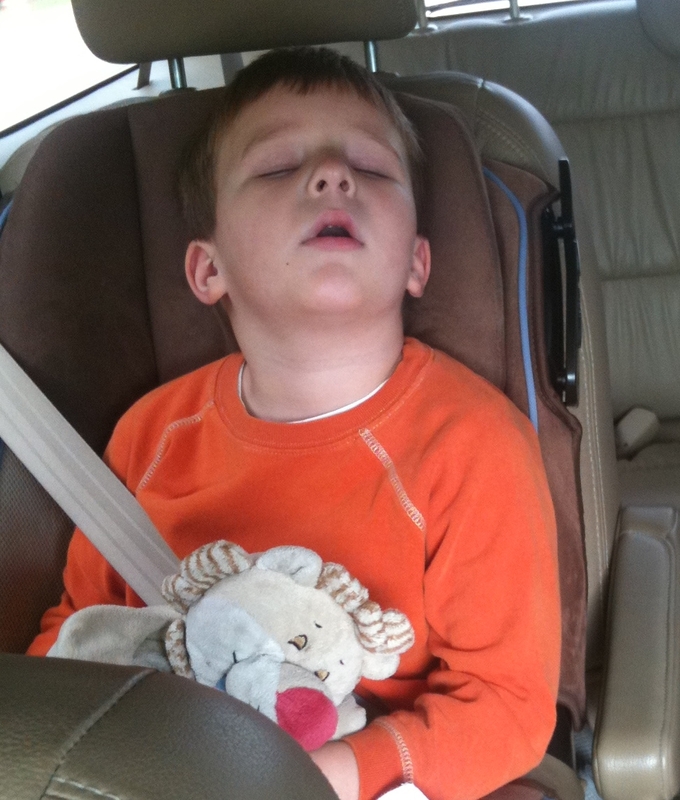 Does it concern you that your children are so attached to their stuffed animals? Leave a comment and tell us your story of your beloved animal and reconnect with that sense of comfort and safety. You’ll feel good all over again, I promise. I’ve kicked around Georgia now for more than 21 years, almost half my life. In all that time, I had only been to Savannah twice. The third time was definitely a charm last weekend as Carla and I were able to parlay a work event Friday night into an excuse to leave the boys with Carla’s parents and have a weekend away. It was just what the doctor ordered for us in the early stages of a rat-race school year overly filled with scouts, band, work and other volunteer responsibilities that prevent such basic relationship necessities as uninterrupted conversations and rest. You can’t beat the Westin Savannah Harbor for a weekend getaway. It’s across the river from downtown, but worth the extra driving distance. We stayed at the Westin Savannah Harbor overlooking the Savannah River, and were treated to a great, 11th floor view of the channel and its bustling activity: freighters laden with containers, tugboats trailing or pulling the container ships, ferries running tourists back and forth to River Street and even the occasional personal watercraft piloted by those who don’t think the last weekend in September is too late in the year to be in the water. We purposefully did not fill our schedule, although we had contemplated everything from a historic trolley tour to a ghost tour. Instead, we just went with our impulses. Sleeping late, brunch, enjoying a breezy walk down River Street and ultimately up into the historic downtown. Inadvertently accomplishing a major Christmas shopping milestone and sampling the goods at Byrd’s Cookie Company was as ambitious as our day got. We left plenty of time for napping poolside and a stack of Southern Livings and Garden & Guns. 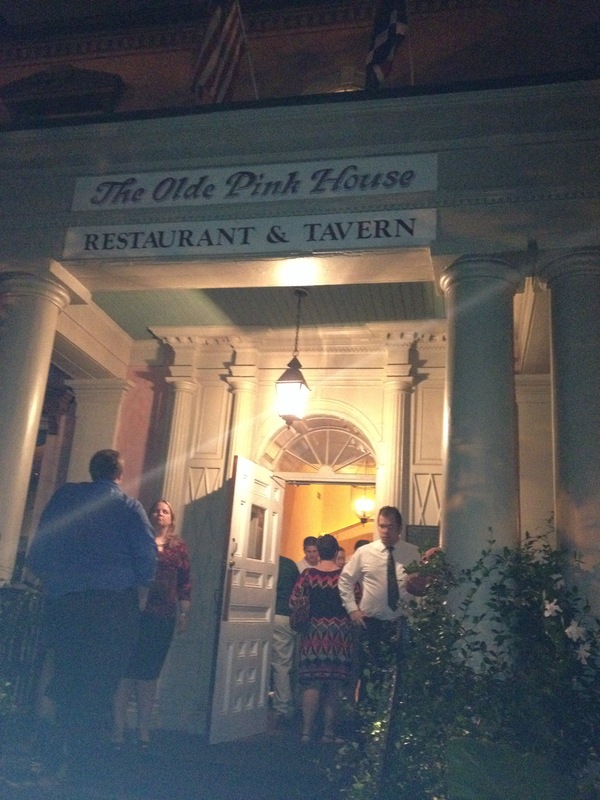 The Olde Pink House is supposedly haunted and is on the Savannah Ghost Tour. The food is hauntingly good. As much as we enjoyed each other’s company, the highlight of the trip was dinner Saturday night at The Olde Pink House, a Savannah landmark and memorable culinary and cultural experience. Our good friends from Macon, Dusty and Tonya, have survived several vacation outings with us, including a cruise, and are the kind of good friends every couple should have. They invite you to be yourself in a sincere way, laugh at your jokes, empathize with your child rearing challenges because of their own three kids, and know enough of the same people to gossip but have enough new in their lives to keep conversation interesting. And since they moved to Savannah two years ago, they have an intimate knowledge of the city they now call home. Interestingly enough, though we spent the better part of six hours together, our conversation tended to break into gender-specific cliques. They talked home decorating while we talked football and Georgia Tech, Dusty’s alma mater and my employer. Not one to have to be the life of the party, Dusty gave us an unexpected treat when The Olde Pink House’s roving improvisational singer came by the table. His premeditated, and perhaps rehearsed, harmonizing with the vocalist on Otis Redding’s “Sittin’ on the Dock of the Bay,” including the whistling part, gave our friendship yet another lifelong memory and the room full of diners something to giggle and whisper about. What can I say, that’s just Dusty. 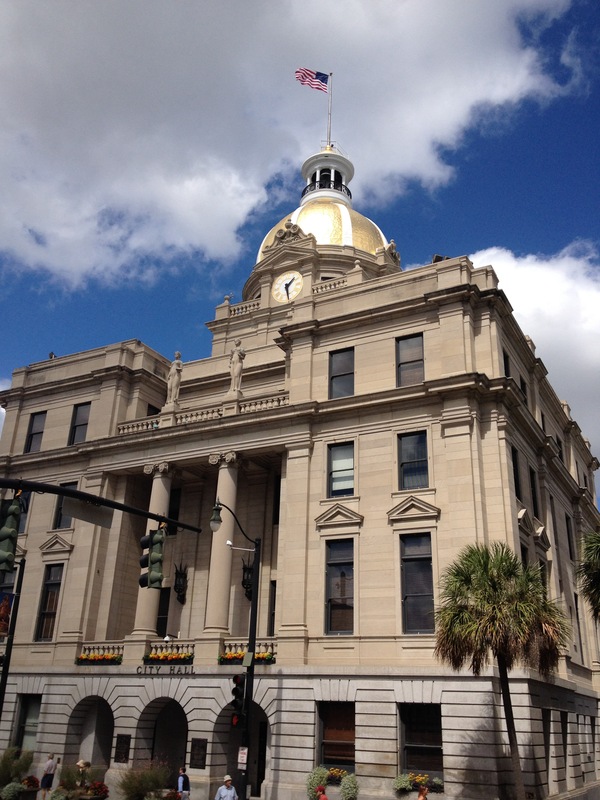 The Savannah City Hall is a landmark that may be impossible to take a bad picture of. It’s one of many beautiful historic buildings in a city filled with parks and squares. Here’s what I learned from the weekend: you appreciate a time out from your regular routine more when it’s infrequent. You need time away from your children in order to appreciate them more. You should never fail to appreciate good friends because you never know when circumstances may separate you. And, finally, you can appreciate your spouse more if you have time to actually talk to him or her. Anyone within a few hundred miles should plan a trip to the oldest city in Georgia – just don’t do it during Spring Break. That’s when we’re planning a return. This time we’ll bring the boys along and have a different kind of memorable weekend that will help the entire family bond. What do you like or dislike about Savannah? Have you ever been? What are must-dos and must-eats in this historic city? Leave a comment below and share your experiences. I get my news from Will McAvoy. The fact that he’s a fictional news anchor and the events he’s reporting on are two years old is really immaterial. Jeff Daniels in a not so “dumb and dumber” pose as the anchor of ACN “News Night with Will McAvoy.” Daniels won an Emmy this week for his work in the role. My good friend, Bob, gave me season one of the HBO series “The Newsroom” on Blu-ray for my birthday this year, and it took me and Carla all of seven minutes to get hooked. The irony is that my recent engorgement on two full seasons of the show has revealed that many of the actual news stories reported on by the fictional cable news team at “Atlantic Cable News,” were only vague recollections in my mind. I’m talking major events: Deep Horizon oil rig explosion, killing Osama Bin Laden, shooting of Gabrielle Giffords, two years of a campaign for president. All of these were dramatized in the show, and I was fuzzy on details. A former newspaper reporter, I have developed news consumption habits that are very New South. I don’t recognize myself any more. Who is this person that looks at his smart phone every five seconds for news updates from Twitter or CNN. Why does this person only read newspapers in an email or website? How can he use podcasts played through his car radio from a Bluetooth connection on his smartphone to fill every minute of his daily commute? And why is it that he has trouble remembering news events from two years ago? I used to read at least three newspapers every day, and by that I mean physically hold pieces of paper. I grew up with the evening news as the background noise to my evenings at home. My parents’ preference was Peter Jennings and his “World News Tonight” on ABC. Various cable news channels were once a staple of my media diet. Radio news, particularly traffic and weather, was always on in my car. But somehow I’ve managed to tune all that out. News happens, I receive it, and then promptly forget about it. It doesn’t have the same stickiness it once had. And there you have it. My hypothesis is that in the New South, which really has never been covered well by the major news entities based in New York and Washington, people are just too busy to care. And when we do stop to gawk at train-wreck types of stories, we don’t retain the details because we move on in 3.6 seconds. I also understand that news these days has flavors. Everyone watches the news that puts the most palatable spin on it for them. We are selective, choosing networks and news outlets that tend to reflect our general outlook on the world. This one-two punch has greatly impacted our level of “informedness.” With so much information at our fingertips, we’re still not really sure what happened in the world last week. So rather than conduct a current events quiz like we all used to take in social studies in school, I’d like to conduct a poll of my own: Do you consume news? In what format (online, TV, radio, print, other)? Do you view yourself as a news junkie? If not, why not? 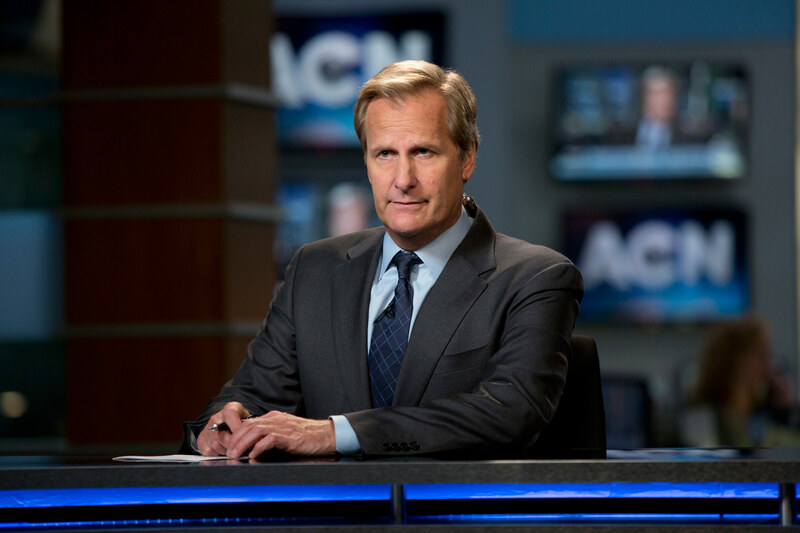 While I wait for the New South polling data to roll in, I think I’ll re-watch some episodes of “The Newsroom” and try to figure out why I trust fictional reporters more than the real ones. Thank you for making New South Essays a part of your weekly… OK, occasional… media consumption. We’ll try to do a better job of keeping your informed. Just like the Atlanta Journal used to purport, “Covering Dixie Like the Dew,” New South Essays is your trusted news source for the new millennium. Now, leave a comment! When did planning a child’s birthday party become a logistical nightmare? Maybe some folks — you denizens of Pinterest, for example — love this delightful opportunity, but it’s beginning to wear on me. As we prepare for Carlton’s fifth birthday celebration, Carla and I face strange dilemmas that didn’t seem to surface with his older brothers’ parties. Last year’s venue, The Little Gym, worked well, and Carlton had a memorable party. Expectations are high this year. Every night when I come home from work I face a different array of venue options and themes. One night it’s a jumpy place. The next night it’s at home in the backyard. I’ve lost track, frankly, and it’s beginning to feel a lot like Christmas… or at least the indecision I have to confront in helping my wife settle on a Christmas card design. Speaking of which, it’s about that time. The considerations for the ideal party location are cost, convenience and choice. We do try to let Carlton have some say in the matter, but honestly, we can just about talk him into anything. He’s like a jury that’s convinced of guilt or innocence after each contradicting testimony. OK, so there is a common theme in his responses, a clue that has led us to choose Catch Air. Carlton has been to a party or two at the Suwanee location, and now that one is about to open nearby in Snellville, it seems like a good fit. So we’ve settled on it… as of press time. We’ll see if it sticks. Making a decision based on convenience has to do with set-up, clean-up and food preparation. Again, with Carlton’s two older brothers, we’ve had our share of at home parties. It is a monumental task to get ready, and you have to be the host and entertainer. Well, I guess you could have a clown or something, but clowns kind of freak me out. Instead, we tend to be amateur cruise directors and move the kids through a series of “centers” like a noisy, chaotic sugar-infused day session of preschool. When you have a party at a jumpy place or some other venue, they take care of all those details. I remember last year during Carlton’s 4th birthday party at The Little Gym. It was weird. I was actually standing around some of the time, talking to my parents and in-laws and friends, while the staff led the kids through a series of tumbles and jumps. I had time to take pictures at the event rather than having to play Captain Kangaroo for a gaggle of children. The best part is that when it’s all said and done, it’s all said and done. No mess. No red punch spilled on the carpet. No random strands of a piñata showing up in the lawn clippings six months later. No remnants of chalk art on the driveway. You load up your haul of loot and head out the door… after you write the check, that is. For Harris’ sixth party, we were all about low-budget, and it was still a huge hit. Maybe variety is the key. That brings us to the final element in this agonizing decision: cost. By having a party at home, you certainly can save money. For a modest budget, you can invite unlimited friends, serve a few snacks and a couple of batches of cupcakes, and send everyone home with the obligatory goodie bag filled with dollar store treasures. However, my wife is not content to do the minimum required or the goody bag filled with candy and junk, and a backyard party can end up costing four times as much as a venue would when you factor in fresh pinestraw, new flowers, fabric tablecloths, and all the other things my wife thinks a party should have. When you go to a party venue, you pay for the convenience of a built-in party. Add to that my wife’s compulsion to do the extras herself as a some sort of creative, Pinterest-y marathon, and the cost starts to skyrocket. The other problem with party venues like a jumpy place is that it creates this awkward tension around the issue of siblings. If you’re just in the backyard, you can freely let all the non-invited siblings attend with a “more the merrier” attitude. When you’re paying per child, you have to be draconian in your guest list and parents with multiple children have their own logistical problems to solve. My wife, the people pleaser and mother of three children herself, can’t stand the thought of causing another mom to have to stress out over what to do with her other kids during our party, and of course she doesn’t want kids to not be able to attend because of siblings in tow. Don’t even get me started on the gifts. Many parents these days are including “no gifts, please” on the invitation, and we have done this before with our older children. My wife thought the plethora of toys we already have and the fact that Carlton’s party last year included an overload of generous gifts was reason enough to go with a “no gifts” party this year. While Carlton is easily persuaded to see our way on location and theme, he will not be swayed when it comes to gifts. Perhaps the gifts become less important as children grow older, but apparently, for a five-year-old, gifts are non-negotiable. We continue to struggle with this as parents. Do we do the practical thing or what that will make our child happy? It just seems that all of this fuss is a construct of the New South. Some parents feel pressure to do it up bigger and better each year, or, worse, to throw a better party than the Joneses. I think for Carla, she just feels the pressure to plan what she views as the perfect party scenario, whatever that means at the moment. For me, I could not care less about the Joneses or a perfect party. I just want to catch a few authentic smiles and hear some unprompted belly laughs from the birthday boy. Oh, and a cupcake wouldn’t be bad either. 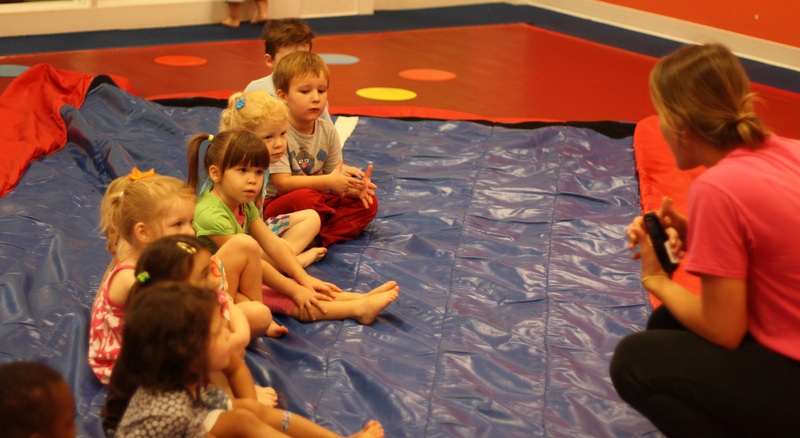 Where do you like to have or go to children’s birthday parties? Has it gotten out of hand? How do you solve the sibling issue? Leave a comment below and give hope to the beleaguered parents of the New South who don’t even realize it’s all just practice for their child’s wedding. The phrase “part of a balanced breakfast” is on the sound track of my childhood. It was included in every super sugary cereal commercial during my decade-long consumption of Saturday morning cartoons. If Cookie Crisp is part of a balanced breakfast, then there had to be some really healthy stuff to go with it to balance it out. As an adult, I’ve come to appreciate breakfast in a new way. With the challenges of managing a morning commute, a “healthy” breakfast has come to mean something completely different. No foodie ever posted a pic like this to his or her Instagram feed, but it gets the job done. There’s “healthy” in the sense that is low-carb, low-fat, low-cholesterol and low taste. 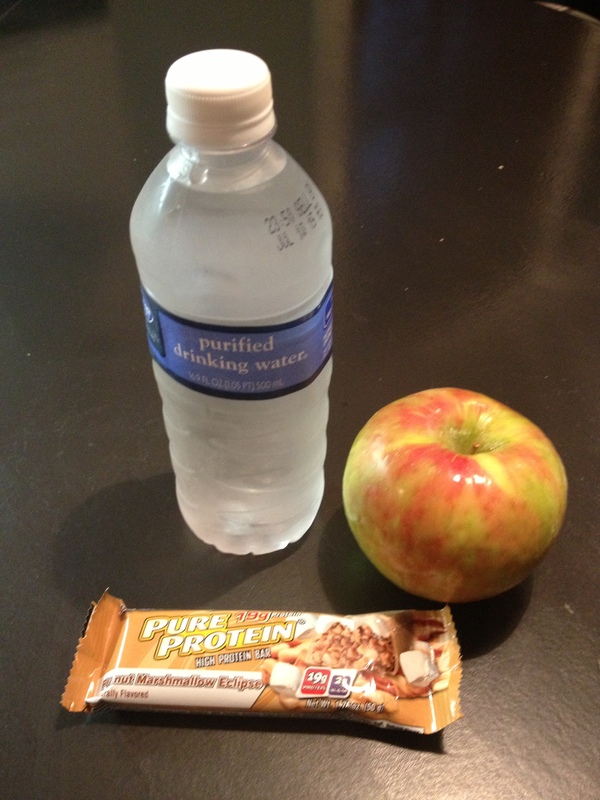 I call this a “New South Breakfast.” For me this usually means a protein bar, banana and a liter of water consumed in the car while fighting traffic. My concentration is certainly not on the food, and there is nothing emotionally satisfying about the experience. I am fueled. My hunger is satiated. I can function. This breakfast comes with a healthy dose of “hon” and “shugah” with every coffee pour. At least once a week, I meet my boss for an “Old South Breakfast” at the Atlanta landmark, the Silver Skillet. I venture around the menu, including having just oatmeal and raisins, but I tend to go with two eggs over medium, grits and biscuits, no meat. If I’m really hungry, I’ll throw in a side of sausage patties. Oh, and as much coffee as the sassy and attentive servers can pour. By any nutritional definition, this is not a healthy breakfast, but I actually enjoy it. I grew fond of grits during college, when it would be souped into giant vats and served with long handled spoons in the cafeteria at Troy. When I ventured out into the world on my own, I never made grits for myself and still find it too much trouble to mess with most of the time. But if my mother-in-law or the good folks at the Skillet are cooking them, count me in. I’ve read that there is no nutritional value in grits. I guess that’s not the point. They’re filling, they help mop up anything else oozing on your plate, and with the right amount of butter and salt, they satisfy. 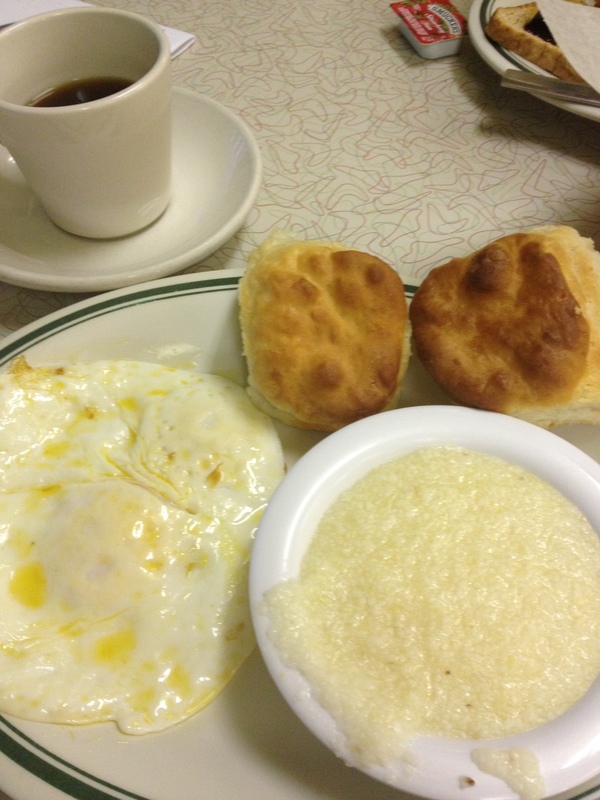 Perhaps my biggest nutritional sin at the Silver Skillet is the biscuit. Or, more accurately, biscuits. With the two-egg breakfast, they bring you two biscuits. Occasionally I can eat just one, but most of the time I end up eating two, with a little jelly. That is not “healthy” by any definition. But these biscuits are very nearly perfect. They are fluffy without being dry. They have just the right amount of butter baked on top so that it has flavor but no grease. They are to be savored and enjoyed. I chalk it up to carbo-loading. The breakfast I’ve come to view as the healthiest of my week is served on Saturday. After an 8 or 10 mile run, I’ll whip up a batch of pancakes and skillet-fried sausage patties or bacon for the whole family. I usually add sliced fruit to my pancakes rather than syrup, and because I’m starved after my run, I add two eggs over hard. It’s a lot of food, but it does the trick. Wolfing this down usually keeps hunger at bay ’til supper time. If that doesn’t sound healthy to you, consider this: Carlton usually helps me stir the batter. The boys eat at the kitchen counter, laughing and telling me all manner of unusual observations about life. When I finish the last batch, Carla and I retire to the dining room and enjoy a leisurely breakfast together, talking about our day, looking ahead to the next week’s schedule and generally catching up after an incredibly busy week. Depending on your definition of healthy, you may rank my breakfast choices differently than I do. But I can’t help but feel that breakfast served with a liberal portion of conversation and family connection is the healthiest. For me, bonding with my family is part of balanced breakfast, and I don’t get enough of it. As for the sugary cereals, they make for a great snack while watching TV before bedtime. What is your breakfast food of choice? Do you ever take time to savor the breakfast experience? 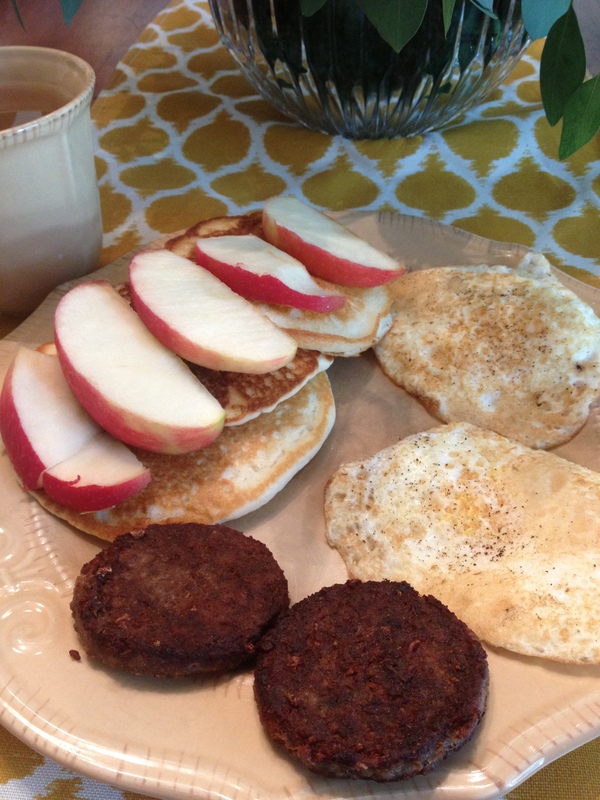 When does your family enjoy breakfast together and what do you eat? Do you have any breakfast favorites you can share? Leave a comment below. It’s part of a balanced blog experience. Hello, my name is Lance, and I have listening problem. This week I attended one of those four-hour workplace training sessions on emotional intelligence. It included an exercise on active listening. I was horrible. 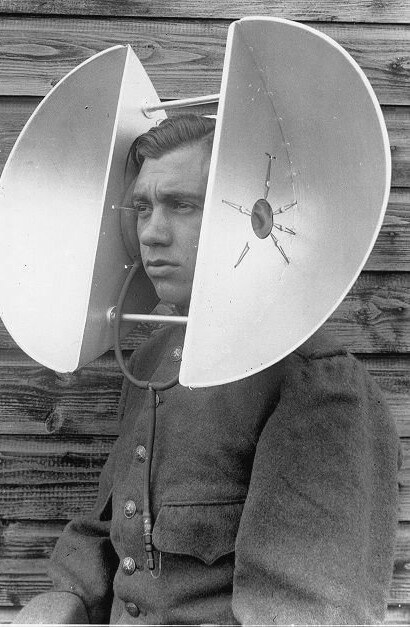 Maybe someone at Tech could invent something like this to help me listen better. The humiliating experience caused me to reexamine a fundamental assumption about myself. Deep down, I believe that I have pretty good emotional intelligence. I feel like I know myself and can read people pretty well. I know how to make eye contact and affirm people when they talk. The examples of my failures to listen are starting to pile up. Two weeks ago during dinner, my 12-year-old son had to confiscate my iPhone because I was texting during dinner. Talk about role reversal! Last weekend, while driving to see my in-laws in Sandersville, Carla said an entire paragraph of information that I completely missed. I suspect I had dozed off. This experience reminded me of a time earlier in my marriage when I first became aware that I cannot listen if a television is on anywhere in my vicinity. When you first begin cohabitating with someone in the throes of marital bliss, you hang on their every syllable. But after a while, words, sentences and even entire monologues can go by, particularly if there’s a ballgame on. 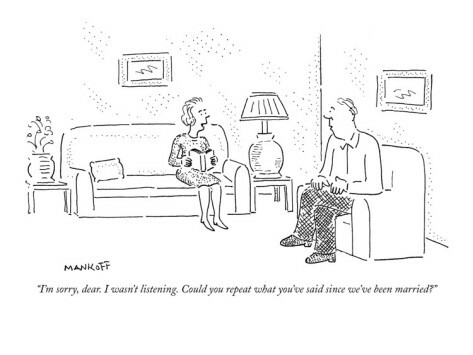 This Robert Mankoff cartoon from The New Yorker is all too true. Fast forward a few weeks when my inattention reoccurred. Guess which pithy saying popped into my head to answer a barrage of accusations? Yep, the wrong one. Like a scene from “Everybody Loves Raymond,” I tried to retract the words as they were coming out of my mouth. Although Carla swears she doesn’t remember the exchange today, I do, and I can tell you unequivocally, don’t ever say anything like that to your spouse … or anyone. What causes my distraction and what’s the cure? To no one’s surprise, one of the biggest culprit’s in the New South is technology. Barron was right to take away my phone. I have done the same thing to him. Conversations are the building blocks of good relationships, and as we enter the teen years with our children, they are essential. I have to learn to turn the screens off. Another culprit is busyness and preoccupation. If I’m busy rushing off to a meeting after church, it’s nearly impossible for me to focus on the person trying to share an important concern. Being in the moment and being with the person in front of you is a discipline. Ultimately, I think it comes down to self-absorption. I find it hard to listen because I am inside my own head way too much. I don’t know about you, but I’m bombarded with thoughts on everything from what I’m going to say next to my to-do list. And if someone is sharing a problem, I think about possible solutions, rather than displaying empathy, letting them share their feelings and affirming them. Admitting you have a problem is the first step. You, the loyal readers of New South Essays, are my support group. Hold me accountable. If you catch me not listening, call me on it. Now stop reading this blog and go listen to someone important to you. You may find that you also have some work to do in the listening department. What annoys you most about people not listening? Is it the ever-present smart phone or tablet screen? Are you a good listener? How do you do it? What techniques might help the rest of us non-listeners? Leave a comment and help in my recovery. It takes all of us.